Cauliflower Waffles | Bacon and Cheddar! We've had our waffle iron for a couple months now. So much experimenting has gone down in our kitchen. I must say that my favorite waffles are these Cauliflower Waffles made with bacon and cheddar cheese. Top them with a dollop of sour cream and some chives, and I'm in waffle heaven. You could now have waffles for breakfast, dinner, and dessert! I'll show you how to make them below. It honestly doesn't get much easier! Who Doesn't Want Waffles For Dinner? Waffles don't always have to be doused in syrup and butter, although that is a great way to eat them. Sometimes, they are best topped with sour cream, cheese and chives, which is exactly how I like to eat these savory Cauliflower Waffles! What's even better is the macros are on point, so you can indulge in them, and they are super quick to whip up on any given night. Now, let me ask you again. Do you want waffles for dinner? As mentioned above, this is my favorite waffle recipe hands down! However, the cool thing about pancake and waffle batter is that they are completely interchangeable. One of our oldest and dearest recipes is keto macro cakes and we know they would taste great as waffles too. We also recently created a decadent double chocolate waffle recipe that is the perfect dinner or dessert recipe! Use this recipe as a base and go wild with different fillings. You can do a Mexican style waffle with chorizo and manchego cheese or a pizza waffle with pepperoni and mozzarella. Options are endless! It wasn't until recently that I looked at waffles in a savory light, and I must say, I can never go back. I've been called waffle girl back in the day which speaks to not only my obsession with waffles, but acceptance of all shapes, sizes and flavors. Another favorite ingredient of mine to use for a savory waffle base is zucchini. (Just be sure to drain the liquid since it can give off a lot more water.) If you are new to the savory waffle scene, I highly recommend you start with these Cauliflower Waffles because it doesn't really get any better than bacon and cheese! 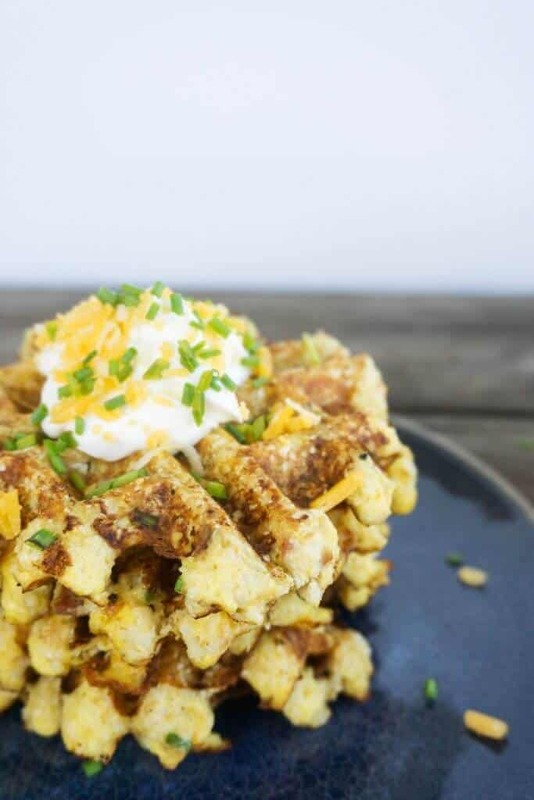 Recipe can be quickly added to MyFitnessPal - Search "KetoConnect - Savory Cauliflower Waffles"
Combine all the above ingredients into a large bowl. Preheat your waffle iron. Using a 1/3 measuring cup scoop out some of the mixture, grease the waffle iron and place the mixture in the center of the waffle iron. Press the waffle iron down onto the mixture so it spreads and allow to fully cook. Repeat until all the mixture is completely used. Optionally, top with sour cream, cheddar cheese and chives! Enjoy! Note: The mixture will make 5 medium waffles or 3 large waffles. Also, the amount of flax meal needed will vary depending on the amount of moisture your mixture has. We needed exactly 1/4 cup, but you may need as much as 1/2 cup - use your best judgement!